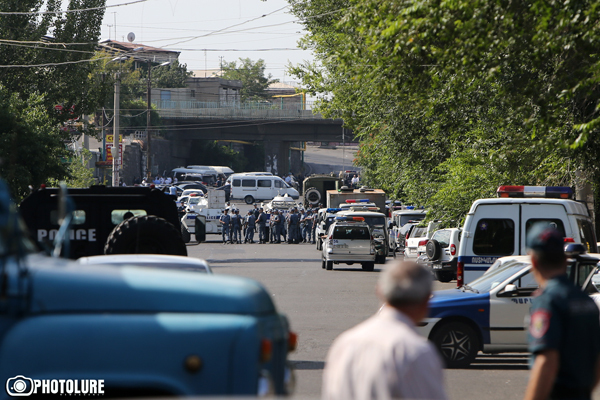 The European Friends of Armenia (EuFoA) follows with attention and deep concern the events that have been unfolding since July 17 in and around the Erebuni District Police Station, in Yerevan, and it deplores the loss of one life and the wounds suffered by several other people involved. Our thoughts are with their families and friends. EuFoA acknowledges the existence of serious frustrations and legitimate expectations within the Armenian society, which can justify protests against the authorities and their actions; but it also condemns, in the strongest possible terms, the use of violence, and deems as totally unacceptable the holding of hostages, especially of medical personnel deployed to provide medical assistance to those in need. EuFoA therefore asks for the immediate release of all hostages, so that negotiations to bring the stand-off to a peaceful end can resume immediately, and eventually succeed. Meanwhile, EuFoA joins the Ombudsman’s calls on all sides to show restraint. This includes calling on the Armenian authorities to uphold the rights of the citizens of Armenia to peacefully express their opinions, prevent police violence, and release all those who were unlawfully detained over the last days without further delay; and on the protesters to refrain from any kind of violence, including verbal attacks and hate speech, namely on social networks. Recognising that these events are the unfortunate result of frustrations and tensions accumulated over a long period of time, EuFoA hopes that they will be a wake-up call for the Armenian government and the various democratic oppositions, and motivate them to engage on a serious and meaningful dialogue at last.